A region’s foodways, (e.g., Boston baked beans and the ubiquitous cod), emerge out of both its cultural resources (the people who live there) and its natural resources. 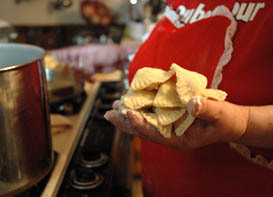 Polish families serve their pierogi. 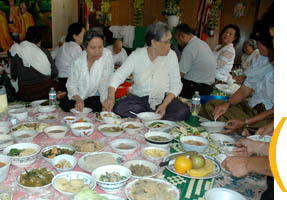 Southeast Asians prepare special rice balls as offerings to the monks during Cambodian Ancestor’s Day, Pchum Ben. "They look like Italian ravioli, Chinese pot stickers, empanadas — every culture has its version of the same thing," says Carol Matyka of Polish pierogi. Foodways have holding power; immigrants bring with them traditions and memories associated with their native foodways. Long after adapting their dress, work, and ways of speaking to American ways, their notions about old-country foodways endure within the family and in public and private events and celebrations.